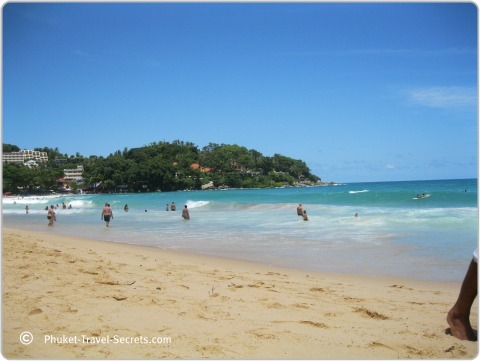 Kata Beach Phuket is a top spot if you're in search of a relaxing getaway or a family vacation in Phuket. The area around Kata is much more laid back and relaxing then the busy streets of Patong. Kata Beach is also known as Kata Bay or Kata Yai, is located just a few minutes south of Karon on the south west coast of Phuket. The beach at Kata is lined with beautiful trees, providing shade which is a welcome relief during the heat of the day. Located under the trees you will find vendors selling a variety of goods including drinks, food and souvenirs. Or you can simply relax in the shade and enjoy a beach massage. The village atmosphere of Kata is more appealing for many visitors and is one of the more popular destinations for family beach vacations in Phuket. As a result, there has been an increased number of visitors and during the high season the beach can be rather busy, but nowhere as busy and hectic as Patong. 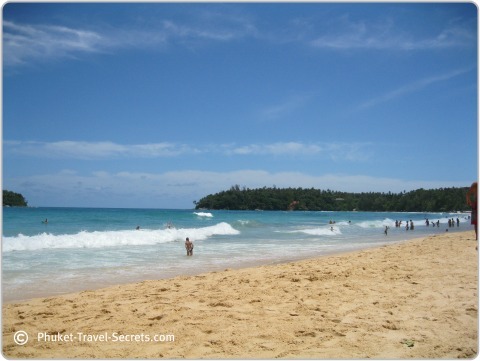 Not only is Kata Beach Phuket one of the most popular travel destinations for families. It is also a perfect location for couples who are looking for somewhere a bit quieter to enjoy a romantic getaway, but without feeling secluded. Visitors that stay at Kata Beach Phuket enjoy spectacular sunsets, fun beach activities and the ever growing facilities that are available in Kata. There is a variety of beach activities available at Kata during the high season, such as sailing, jet-skis, banana boat rides, para sailing and windsurfing. Towards the northern end of the beach there is a small Island called Koh Pu or Pu Island, this coral reef provides a perfect spot for snorkelling. 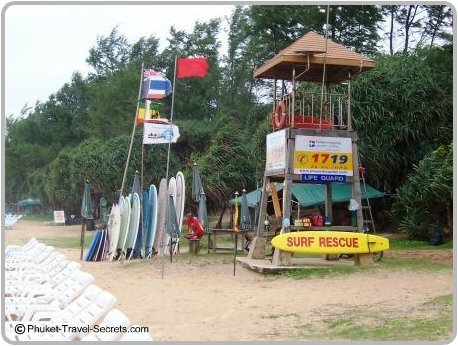 Throughout the low season Kata Beach is also one of the best surfing beaches in Phuket. Surfboards and bogie boards can be hired along the beach, if you don't know how to surf you can also have a couple of surfing lessons. Sunbeds are available for rent and can be hired from the vendors for around 100 baht per day, but you will have to get there early in the high season. 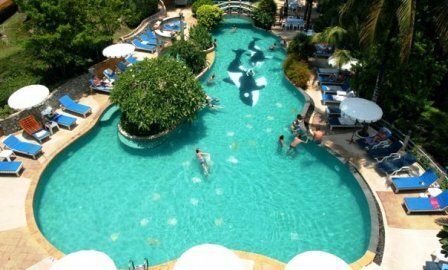 Kata Beach has some excellent accommodation choices, from guesthouses and apartments to a range of hotels, resorts, and luxury villas. Club Med occupies the area closest to the beach, however in the streets just back from the beach there are lots of boutique hotels and guesthouses that are very appealing. Below are just a few of our favorite places to stay in Kata. 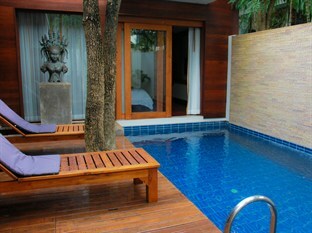 The Beach Boutique Hotel is located 10 minutes walk from Kata Beach. 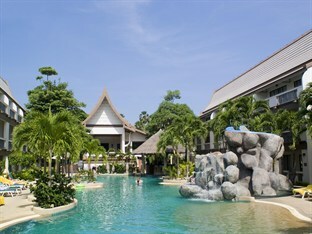 Kata Poolside Resort is in a good location set back from the road and only 3 minutes walk to Kata Beach. 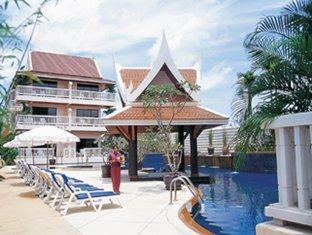 Centara Kata Resort is located in the heart of Kata. Beyond Resort Kata is set in a great location right on the beachfront towards the southern end of Kata. Malisa Villa Suites is an ideal spot for honeymooners or those looking for a romantic getaway. The villas are spacious and well designed. Located right in the centre of Kata and only a 10 minute walk to the beach. Read more about the resort on Agoda. 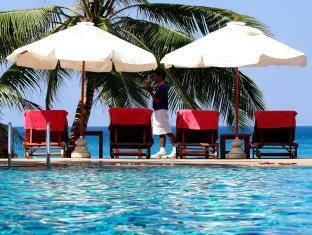 Chanalai Garden Resort has beautiful ocean views. This resort was formally known as the Tropical Garden Resort. 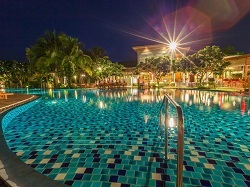 Metadee Resort & Villas is a fantastic choice, located 10 minutes walk from Kata Beach. Read more on Agoda. Kata Beach also has an impressive range of villas, these include privately owned luxury villas that are available for short and long term rent. 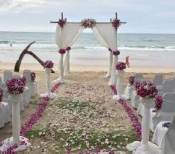 If your interested in staying in a villa have a look at our tips about hiring a villa in Phuket. 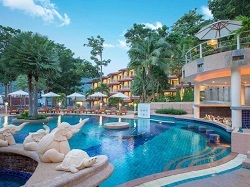 Closer to the beach you will find some lovely budget hotels and five star resorts, click search below to find your preferred hotel at Kata Beach. 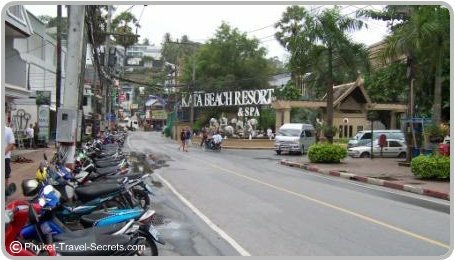 Kata Beach Phuket is an easy walk from Karon, along the way you will find handicraft shops and stalls selling a range of goods including cushion covers, cheap jewelry, DVD's, CD's, sunglasses, billabong shirts, billabong shorts and bikinis. Towards the southern end of Kata there is Kata Plaza, here you can buy more billabong shorts and shirts, shoes, fake watches and sunglasses. Just over the hill from Karon at the northern end of Kata just passed Starbucks is a T Junction, here you will find an air conditioned fixed price store called Udomagg. Udomagg is heaven for shoe lovers, they also have a large variety of handbags, wallets, suitcases and handicrafts. If you are looking for genuine sportswear head to the Adidas and Nike Outlet that is located opposite the Kata Beach Resort Phuket on Kata Road, it is open daily from 10.00am to 11.00pm. We were amazed at how many Opticians there are in Kata, so if you are looking for some nice genuine frames maybe it is worth while checking out the prices. There is also many tailors located in Kata, ensure that you get a couple of quotes and always bargain with them to get the best price and remember to allow enough time for fittings. Mini -Marts, 7 Elevens and pharmacy's are scattered throughout the area. 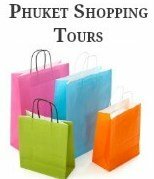 Shopping in Phuket is wonderful, so make sure that you make time to spend a few hours exploring the shops. The nightlife in Kata Beach Phuket is very laid back and relaxing. As Kata mainly attracts couples and families the bar scene is a lot quieter than Patong or Karon, although there is still a good selection of bars. Most of these bars can be found around Taina and Patak Roads. At the southern end of Kata Beach Phuket you will find a popular nightspot called the Ska Bar, here you can listen to some reggae and hip hop. The bar stays open until late and if you are lucky you may get to see the bar staff do their nightly fire show. If you are looking for a pool table the Mellow Bar has one and a collection of music including Jazz, Blues and R'n'B. Phuket has an abundance of nightlife, and you will find that you just haven't enough time to go everywhere you want to go. Kata has a large selection of restaurants, most of which are reasonably priced, especially around Kata Centre. You will find cuisines from all over the world and there is no shortage of Thai restaurants in Kata. Some of the best restaurants in Kata Beach we found were the Two Chef's Restaurant here you can enjoy juicy steaks, Thai food, fresh seafood and Mexican specials. Horn Grill is located opposite Kata Beach Resort, serving imported Australian beef and lamb, seafood and Thai food. For a romantic evening and superb food make your way to The Boathouse Wine & Grill, located directly on Kata Beach. Overall we have found Kata Beach Phuket to be a top spot for both family vacations and a fantastic destination for a romantic getaway. From Karon drive south along the beach until you get to an intersection, turn right into Pak Bang Road.